A newly discovered trove of Aztec sacrifices could lead archaeologists to an elusive Aztec emperor’s tomb. Such a discovery would mark a first since no Aztec royal burial has yet been found despite decades of digging. The sacrificial offerings, including a richly adorned jaguar dressed as a warrior, were found in Mexico City, Reuters reports. 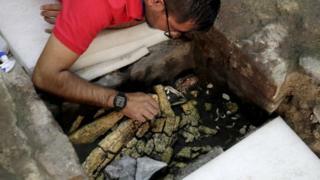 “We have enormous expectations right now,” lead archaeologist Leonardo Lopez Lujan said. Discovered off the steps of the Aztec’s holiest temple, the sacrificial offerings also include a young boy, dressed to resemble the Aztec war god and solar deity, and a set of flint knives elaborately decorated with mother of pearl and precious stones. The offerings were deposited by Aztec priests over five centuries ago in front of the temple where the earliest historical accounts describe the final resting place of Aztec kings. Only around a tenth of the box has been excavated but plenty of artefacts have already been uncovered, including a large amount of shells, bright red starfish that likely represented the watery underworld the Aztecs believed the sun travelled through at night before emerging in the east to begin a new day. “There’s an enormous amount of coral that’s blocking what we can see below,” said archaeologist Miguel Baez, part of the excavation team. Route to an Aztec king? Chroniclers detailed the burial rites of three Aztec kings, all brothers who ruled from 1469 to 1502. According to these accounts, the rulers’ ashes were deposited with opulent offerings and the hearts of sacrificed slaves. In 2006, a huge monolith of the Aztec earth goddess was found nearby with an inscription corresponding to the year 1502, which is when the empire’s greatest ruler and the last of the brothers, Ahuitzotl, passed away. Elizabeth Boone, an ancient Mexico specialist at Tulane University, notes that that the jaguar may represent the king as a fearless warrior.